Gunite is a verb. It is an application process in the pool industry. In fact, gunite is a sprayed cement process conveyed pneumatically through a hose at high velocity onto a receiving surface. What that means is that it is cement that is sprayed through a hose like water through a fire-hose! The mixture used is an aggregate (sand, gravel, etc.) and paste (Portland cement). The highest quality pools built are gunite as they are engineered to withstand the movement of the earth due to the strength of the gunite, of the rebar skeleton over which the gunite is sprayed, and the tensile strength of the structure itself. The cure time of a freshly sprayed gunite pool is relatively quick at 7 to 10 days, during which the homeowner is required to “water down” the structure to aid it in curing properly. After this time, construction procedures like tile and coping or other interior finishes can be applied. Now, what about costs you ask? 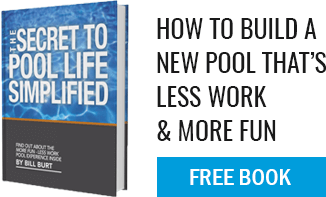 The cost of installing an inground gunite pool varies. Just as it is difficult to answer a question like, “how much does a house cost?” There are always circumstances to consider. However, the basic, freeform (kidney or similar) shaped inground gunite pool typically starts in the low $30,000 range. Once the final shape and size is determined, our team at Aqua Pool can calculate the price of a gunite pools based upon the area and the perimeter of the pool. Additionally, there are usually add-on features that are desired by the owner. These can be added to a basic pool package (pebble interior finishes, attached spa, custom masonry stonework, etc.) and will influence costs. Our highly trained, in-house pool designers are great at educating buyers as to what features are available, what benefits those features offer, what is the newest and best technology available, and then from here, we work together with our customer to design an inground gunite pool that meets not only their needs but their budget. Aqua Pool can create an a la carte menu for you so that you can pick and choose which features are the most important, eliminate features that are not important or that can easily be added later, and create the custom backyard dream pool you deserve. The best quality pool possible is a gunite pool!